1. Remind yourself that our celebrations from December 21 through January 1 are not Christian in origin. All over the northern hemisphere, people have celebrated this time as one of birth and new life. Solstice is the reason for the season, and December 25th was the day of solstice under the old Roman calendar. The return of light, the budding of new life, the promise of fresh starts—these were particularly precious to agrarian people who entrusted themselves, one year at a time, to the cycle of the seasons, but they are precious to us all. Here are 12 pre-Christian holiday traditions that aren’t about God or shopping. 5. Get creative. Draw on your inner artist. The best art takes old elements and assembles them in a way that is unique to the artist. Create your own rituals. What is your life about? What do you want to celebrate and with whom? What might the decorations look like? Which smells and tastes do you savor? What music does resonate? Do what feels genuine, and then persist. Developing a solid sense of ritual and tradition takes time and repetition. 7. Be a little wicked if you like. 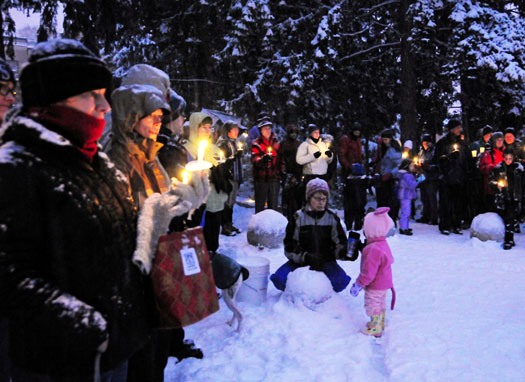 Religious people use the holidays for drawing in new believers or old believers who have fallen by the wayside. Sometime their evangelism comes from the thoughtless assumption that you share their point of view, and sometimes it is intentional. It’s part of our cultural dynamic, so feel free to do the same. Send solstice cards. Invite even religious friends to your celebrations. 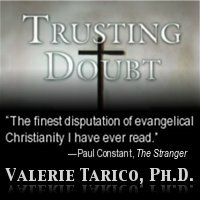 Give a receptive friend the gift of growth: If someone is wobbling their way out of Christianity, give them a copy of my book, Trusting Doubt. For a friend who may be ready to move from born again “beliefism” to a more thoughtful form of Christian faith, give Bruce Bawer’s Stealing Jesus. For someone who would like to see the Bible through the eyes of an unflinchingly honest Christian antiquities scholar, get Thom Stark’s, The Human Faces of God. 8. Balance your gift giving. Stand on principle–some of the time. Face it, certain kinds of gifts don’t mean much, but not giving them does. Your integrity doesn’t stand or fall based on whether you give the token “Christmas” gifts to your boss, co-workers or neighbors. Go to Starbucks and buy a dozen gift cards, or if time costs you less than money right now, bake those cookies. Tell people you wish them well—because you do–and be done with it. When it comes to real time and money, though . . .
Is it Ok to Celebrate Christmas Even If You’re Not a Christian? Gallery | This entry was posted in Uncategorized and tagged Christmas, recovery from religion, solstice. Bookmark the permalink.